They just couldn’t believe they had been so wrong. And maybe they weren’t: There was Karl Rove on Fox saying Ohio wasn’t settled, so campaign aides decided to wait. They didn’t want to have to withdraw their concession, like Al Gore did in 2000, and they thought maybe the suburbs of Columbus and Cincinnati, which hadn’t been reported, could make a difference. Romney was stoic as he talked to the president, an aide said, but his wife Ann cried. Running mate Paul Ryan seemed genuinely shocked, the adviser said. Ryan’s wife Janna also was shaken and cried softly. The wives of the job-destroyers didn’t get what they had convinced themselves they were entitled to. “He was shellshocked,” one adviser said of Romney. How many of the people whose lives have been destroyed by Bain Capital were “shellshocked” upon being told that a cadre of rich bastards had bought the company they worked for for 5% down, loaded the thing up with debt, paid themselves hundreds of millions of dollars in bonuses and ‘management’ fees, and then – to pay for all of those bonuses and ‘management’ fees – decided to lay off all of the company’s workers and kill the company? Mitt won’t be even with the house until he has a Tuesday night for every life he’s destroyed in order to pay for dancing horses, car elevators and a wife who is addicted to the obscene entitlement of unearned wealth. If he lives for another hundred years he’ll never be even with the house – because its not just the lives of the workers whose jobs he rolled up and used for toilet paper; its the lives of those workers’ spouses, those workers’ children and everyone whose businesses were negatively affected by the actions of the Bain Bastards. 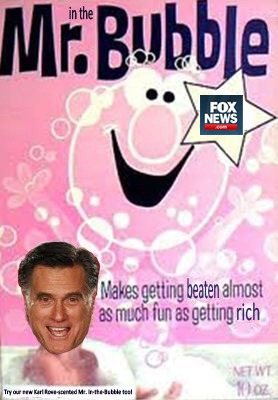 Mitt Romney is an overly-entitled, rich, lying bully who, finally for the first time in his life (well, second if you count the 1994 Senate race), was not able to con and bully his way to getting whatever he and his plastic wife and obnoxious kids want whenever they want it. The faster that you all leave the collective American psyche the better.